The “Nation’s Report Card” is released by The National Assessment of Educational Progress (NAEP) every year where students are tested at ages 9, 13, and 17. This past year, the testing results for readers at age 17 were abysmal, demonstrating only a 2% growth in reading scores over the past 41 years. More 17-year-olds commit crimes than any other age group, according to recent studies by psychiatrists. Nature also provides an example of frenetic activity that can happen in one seventeen year cycle. Consider that cicadas remain buried for seventeen years before coming out and breaking into their mating song. Coincidently there are quite a number of songs, mating or otherwise, that center their message on how it feels to be seventeen. Seventeen is an age of complications. Don’t even get me started on Rogers and Hammerstein’s I am Sixteen Going on Seventeen from The Sound of Music; poor Lisel has Nazi problems in her secret romance! Each song, (and yes, I know there are many others) explores the multitude of contradictions in being seventeen. Collectively, the lyrics show how seventeen is a seething ferment of frustration, experimenting, wishing, waiting, and wanting; a potent potion for those tipping into adulthood. And this is the targeted population for nationwide testing? Therefore, when the annual sample of seventeen year olds is selected to take the NAEP test in order to diagnosis the reading level of the nation’s seventeen year olds, I wonder, how invested are they in this task? These are the students who have been state standardized tested at every grade level, they have been PSAT, SAT or ACT tested, and maybe Advanced Placement tested. What does this extra test, with no impact on their GPA, mean to them? So what did the Beatles mean when they sang, Well, she was just seventeen, you know what I mean? We were learning our skill. John would like some of my lines and not others. He liked most of what I did, but there would sometimes be a cringe line, such as, ‘She was just seventeen, she’d never been a beauty queen.’ John thought, ‘Beauty queen? Ugh.’ We were thinking of Butlins so we asked ourselves, what should it be? We came up with, ‘You know what I mean.’ Which was good, because you don’t know what I mean. Maybe we should take this advice from Paul and John and all the other recording artists. 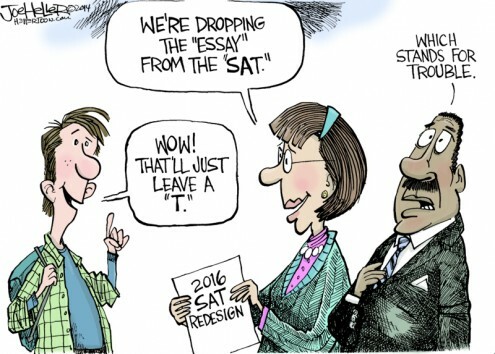 Maybe the only thing we are testing for the past 41 years is how seventeen year olds test the same in every generation. Maybe just being seventeen means confronting more immediate problems, and these problems do not include taking a NAEP test. Maybe there should be some variable or some emotional handicap considered for testing at age seventeen …you know what I mean? 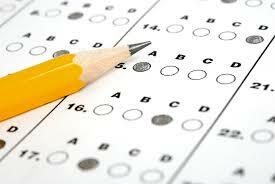 This past week, I wrote a blog post that critiqued the results of The National Assessment of Educational Progress (NAEP) 2013 test. There was a 2% growth in reading scores over the past 41 years for students at age 17. 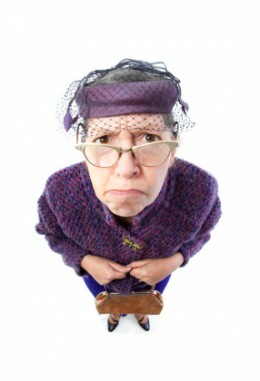 Billions of dollars, paper piles of legislation, incalculable time…..and the result has been an abysmal 2% increase. In a subsequent post, I wrote how NAEP also provided data to prove independent reading was the key to improving test scores. 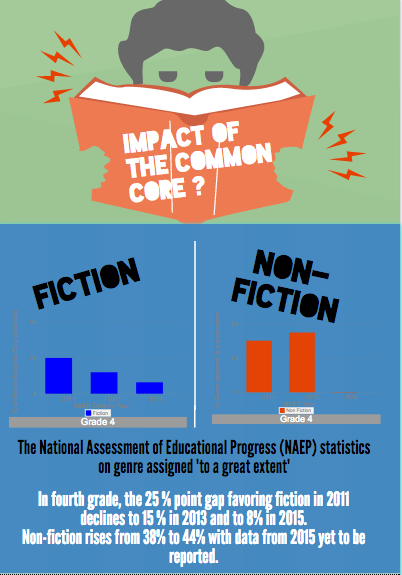 NAEP reported that students who claimed to read for fun scored higher on standardized tests with the obvious conclusion that the more time a student spent reading, the higher the student’s score. This information, included in a report that demonstrated a failure of reading programs, offered a possible solution for increasing reading scores: adopt a no-cost, read for fun initiative in order to improve results. We know all about the rewards that reading offers, but sometimes our more reluctant readers need a little extra incentive. 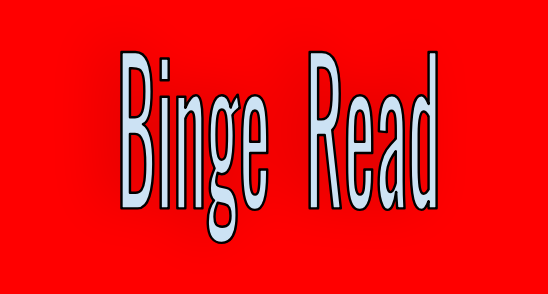 The Reading Rewards online reading log and reading incentive program helps make reading fun and satisfying. Find more about Reading Rewards’s benefits for parents and teachers. The rate of book reading increased astronomically . . . [but the use of rewards also] changed the pattern of book selection (short books with large print became ideal). It also seemed to change the way children read. They were often unable to answer straight-forward questions about a book, even one they had just finished reading. Finally, it decreased the amount of reading children did outside of school. Notice what is going on here. The problem is not just that the effects of rewards don’t last. No, the more significant problem is precisely that the effects of rewards do last, but these effects are the opposite of what we were hoping to produce. What rewards do, and what they do with devastating effectiveness, is to smother people’s enthusiasm for activities they might otherwise enjoy. Kohn’s explanation in his A Closer Look at Reading Incentive Programs (Excerpt from Punished by Rewards 1993/1999) illustrates the problems that develop for late middle school and high school teachers (gr 7-12) experience once elementary students have experienced a reward program with their reading. Students who are conditioned to read for any kind of reward develop a Pavlovian response. They learn to expect a reward; once the reward is removed, however, they lose interest. “Grade me! Look at me! Evaluate and rank me! I’m good, good, good and oh so smart! 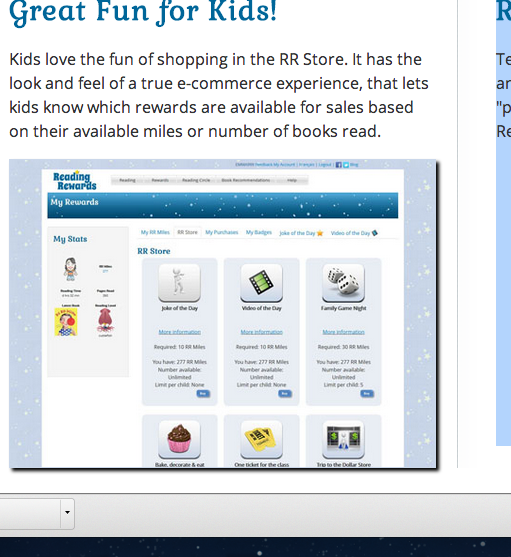 While grades are not the currency for this website, Reading Rewards is perfectly positioned to be a commercial enterprise with language on the site promoting the RR “store” and “e-commerce”. This initial shopping experience may be for some trinket in a teacher’s box, a homework pass, or a pizza party, but the potential for “shopping” on this site is certainly a possibility. But what matters more than the fact that children read is why they read and how they read. With incentive-based programs, the answer to “why” is “To get rewards,” and this, as the data make painfully clear, is often at the expense of interest in reading itself. So while the key to independent reading is the key to raising reading scores, students should not be raising profits for software companies as well. There are other features on this software that are admirable. The site includes places for reading logs, creating reading wish lists, and peer sharing reviews, but those features could be accomplished on a (free) blog or wiki without the distractions of prizes or rewards. I do not fault the teacher who was well-intended when she tweeted out this website. She wants students to read for fun. The NAEP report proves that independent reading can effectively raise scores when the reading is self-motivated reading for pleasure. Teachers should question, however, when reading for fun is linked to reading with “funds”. 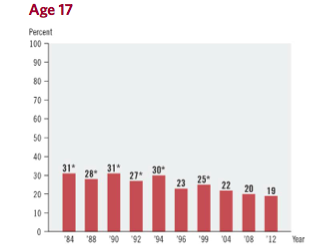 The release of the National Assessment of Educational Progress (NAEP) Progress Report for 2012 (“Nation’s Report Card”) provides an overview on the progress made by specific age groups in public and private schools in reading and in mathematics since the early 1970s. The gain in reading scores after spending billions of dollars, countless hours and effort was a measly 2% rise in scores for 17-year-olds. After 41 years of testing, the data on the graphs show a minimal 2% growth. After 41 years, Einstein’s statement, “Insanity is doing the same thing repeatedly and expecting different results,” is a confirmation that efforts in developing effective reading programs have left the education system insane. Independent reading, in contrast, is deliberately void of any assessment. Students may choose to participate in a discussion or keep a log on their own, but that is their choice. The only measurement is a student’s willingness to volunteer the frequency of their reading, a form of anecdotal data. According to the graph below (age 17 only), students who volunteered that they read less frequently were in the low to mid-level ranges in reading. Students who volunteered that they read everyday met the standards at the top of the reading scale. Sadly, this NAEP data recorded a decline in reading for fun over the last 17 years-exactly the age of those students who have demonstrated only a 2% increase in reading ability. The high number of independent readers (“reading for fun”) was in 1994 at 30%. So what happened the following years, in 1995 and 1996, to cause the drop in students who read voluntarily? What has happened to facilitate the steady decline? In 1995 there were many voices advocating independent reading: Richard Allington, Stephen Krashen, and Robert Marzano. The value of independent reading had been researched and was being recommended to all districts. Profit for testing companies or publishing companies, however, is not the motive in independent reading programs.There are no “scripted” or packaged or leveled programs to offer when students choose to “read for fun”, and there is no test that can be developed in order to report a score on an independent read. The numerical correlation of reading independently and higher test scores (ex: read 150 pages=3 points) is not individually measurable; and districts, parents, and even students are conditioned to receiving a score. Could the increase of reading programs from educational publishers with leveled reading box sets or reading software, all implemented in the early 1990s, be a factor? Or perhaps the controversy on whole language vs. phonics, a controversy that raged during the 1990s, was a factor? Whole language was increasingly controversial, and reading instructional strategies were being revised to either remove whole language entirely or blend instruction with the more traditional phonics approach. While the scores from standardized testing over 41 years according to the NAEP report show only 2% growth in reading, the no cost independent “reading for fun” factor has proven to have a benefit on improving reading scores. Chart #1 shows a difference of 30 points out of a standardized test score of 500 or a 6% difference in scores between students who do not read to those who read daily. Based on the data in NAEP’s report, reading programs have been costly and yielded abysmal results, but letting students choose to “read for fun” has been far less costly and reflects a gain in reading scores. The solution to breaking this cycle is given by the authors of The Nation’s Report Card. Ironically, these authors are assessment experts, data collectors, who have INCLUDED a strategy that is largely anecdotal, a strategy that can only be measured by students volunteering information about how often they read. 41 years Later, a “2% Increase in Reading”. Wait, um…. That’s It? I recently had to write a position statement on assessment and evaluation. 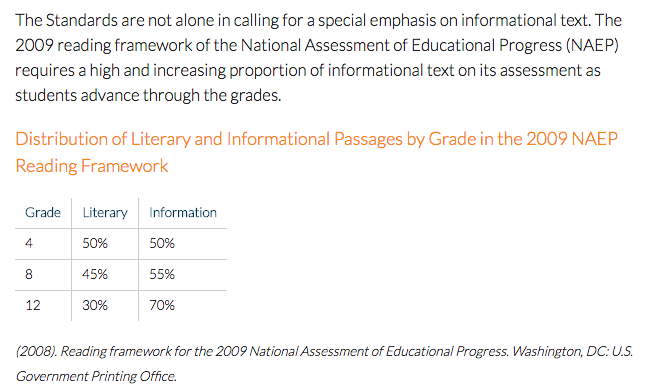 The timing of this assignment, June 2013, coincided with the release of the National Assessment of Educational Progress (NAEP) Progress Report for 2012. This “Nation’s Report Card” provides an overview on the progress made by specific age groups in public and private schools in reading and in mathematics since the early 1970s. Based on the 2012 NAEP Report results, what difference(s) in reading scores separates a 17-year-old high school student in 1971 from a 17-year-old high school student in 2012? You could act on your most skeptical instincts about the costs and ineffectiveness of standardized testing and make a calculated guess from the title of this blog post or you could skim the 57 page report (replete with charts, graphs, graphics, etc) that does not take long to read, so you could get the information quickly to answer correctly: choice “D”. Yes, 41 years later, a 17-year old scores only 2% higher than a previous generation that probably contained his or her parents. There have been billions of dollars invested in developing reading skills for our nation’s children. In just the last twelve years, there has been the federal effort in the form of Reading First, the literacy component of President Bush’s 2001 “No Child Left Behind” Act. Reading First initially offered over $6 billion to fund scientifically based reading-improvement efforts in five key early reading skills: phonemic awareness, phonics, fluency, vocabulary, and comprehension. The funding of grants for students enrolled in kindergarten through grade three in Title I Schools began in 2002-2003. There have been efforts to improve literacy made by non-profit educational corporations/foundations such as The Children’s Literacy Initiative, the National Reading Panel, and a Born to Read initiative from the American Library Association. In addition, there have been a host of policy statements from The National Council of Teachers of English and programs offered by the National Writing Project that have helped to drive attention towards the importance of reading. All of these initiatives drove publishers of educational materials to create programs, materials and resources for educators to use. Unfortunately, the question of which reading program would prove most effective (Direct Instruction, Reading Recovery, Success for All and others) became a tangled controversy as charges of conflicts of interest between the consultants who had been hired by the Department of Education (DOE) and who trained teachers and state department of education personnel had also authored reading programs for curriculum. Fuel to this controversy was added when a review in 2006 by the DOE’s Inspector General suggested that the personnel in the DOE had frequently tried to dictate which curriculum schools must use with Reading First grant money. Trying to improve our our students’ reading scores has been the focus so much so that our education systems have been awash in funding, materials, initiatives and controversies since 2001 in our collective to improve reading for students…and the result? The result is a measly 2% of growth in reading for those leaving our school systems. Readers at this level use intermediate skills and strategies to search for, locate, and organize the information they find in relatively lengthy passages and can recognize paraphrases of what they have read. They can also make inferences and reach generalizations about main ideas and the author’s purpose from passages dealing with literature, science, and social studies. Performance at this level suggests the ability to search for specific information, interrelate ideas, and make generalizations. Readers at this level can locate and identify facts from simple informational paragraphs, stories, and news articles. In addition, they can combine ideas and make inferences based on short, uncomplicated passages. Performance at this level suggests the ability to understand specific or sequentially related information. Readers at this level can follow brief written directions. They can also select words, phrases, 9 or sentences to describe a simple picture and can interpret simple written clues to identify a common object. Performance at this level suggests the ability to carry out simple, discrete reading tasks. 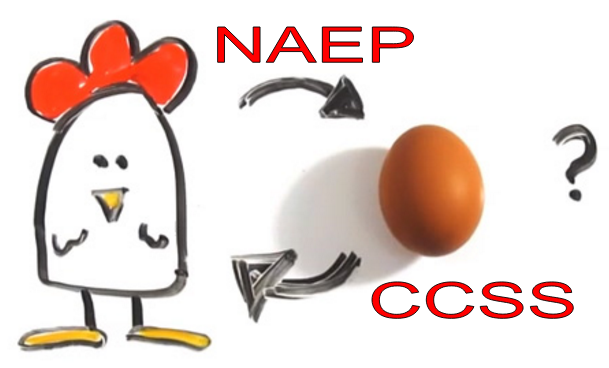 The NAEP report does offer some positive developments. For example, from 1971-2012, reading scores for 9-year-olds have seen an increase of 5% in students reading at the lower (150) level, an increase of 15% for students reading at mid-range (200), and an increase of 6% for students reading at the higher (250) level. Similarly, reading scores for 13-year olds have increased 8% for students reading at mid-level, and 5% for students at the higher level. Scores for student reading at the lower level, however, saw a negligible increase of only 1%. Even though White students continued to score 21 or more points higher on average than Black and Hispanic students in 2012, the White – Black and White – Hispanic gaps narrowed in comparison to the gaps in the 1970s at all three ages. The White – Black score gaps for 9- and 17-year-olds in 2012 were nearly half the size of the gaps in 1971. Unfortunately, even that positive information should be considered with the understanding that most of these gains for racial and ethnic groups were accomplished before 2004. Finally, for students leaving public and private school systems, the overall news is depressing. Any gains in reading in ages 9 and 13, were flattened by age 17. The growth for students reading at higher level dropped from 7% to 6%, while the percentage of mid-range readers remained the same at 39%. The gains of 3% were in the scores of lower range readers, from 79% to 82%. Considering the loss of 1% at the higher end, the overall growth in measurement is that measly 2%. That’s it. A financial comparison would be a yield $.02 for every dollar we have invested. Another comparison is that for every 100 students, only two have demonstrated improvement after 13 years of education. The headline in The New York Times (6/13/2013) was a little misleading, Study Gauges Value of Technology in Schools. The topic of gauging the value of technology is particularly significant given the investment by school districts everywhere in laptops, tablets, computer labs, Smartboards, whiteboards and projectors; but the article only referred to the use of technology in math or science. When states do begin to collect data on the use of technology in the classroom, their studies should be broadened to include how technology is being used in other disciplines, specifically the language arts/English classrooms to facilitate writing. In contrast to reports of math and science technology use, language arts teachers are using a multitude of digital platforms to facilitate communication between students; technology offers opportunities for students to engage in formal and informal writing at every grade level. Multiple digital platforms such as blogs or wikis allow students to post responses to questions posed by teachers. Students can share essays in order to peer edit or collaborate on projects, or students can follow links and create data in surveys and respond to the data created. For example, an assignment for 9th grade students as part of a Romeo and Juliet unit to respond to a writing prompt can use multiple digital platforms to generate sophisticated responses. The assignment was posted on EDMODO and contained data from a student/parent survey on arranged marriages that students and their parents had completed on a Google Doc form. The survey results were posted on PBWorks for students to access for homework. Students needed to review the scene where Lord Capulet arranges Juliet’s marriage to the Count Paris before writing a response. Each response that was posted was available for the class to review and to discuss. The worldwide wide divorce rate for arranged marriages is 4%; this could be due to cultural taboos regarding divorce. Look at the data on the page that you and your parents created. What differences do you notice in your attitudes towards arranged marriages? Now, Consider how the Capulet’s choice of Paris for Juliet may have been the better choice. Was Romeo and Juliet’s choice to follow their passion the right decision? Should they have followed their parent’s wishes? Why this decision is important for future couples. This assignment required a sophisticated analysis of data that the students had created, and an general analysis of characters from Shakespeare’s play. If Romeo and Juliet had listened to their parents almost all of this never would have happened. Even though just letting their parents choose would have solved everything, it was their decision. Romeo and Juliet had every right to choose their lives. Even the data from the survey shows that most children and parents don’t approve and less than 40% of people thought parents should choose. The Capulets didn’t know anything about their daughter and is trying to match her with someone who is completely wrong for her. This is why Eharmony uses Math equations because that is a lot more reliable than your parents. In my opinion, Romeo and Juliet’s choice to follow their passion was the right choice. 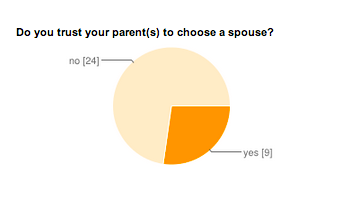 In the survey, some parents said that they could pick their child’s spouse. “I think I know my daughter well enough to know what kind of spouse she is looking for.” This parent has the same idea that Juliet’s did when they arranged for her and Paris to be married. Obviously in Juliet’s case, an arranged marriage did not work. She rebelled and went for Romeo. “Where is my Romeo?” was one of the first things Juliet said when she awoke from her sleep. Romeo and Juliet were love drunk and when they died they were both insanely happy. This is an important for future couples because if they’re in an arranged marriage it may end in death because one or both people are miserable. I think that maybe Romeo and Juliet should have followed what their parents want. In our survey, 1/3 of the parents said they would be ok choosing their kid’s spouse, and 1/4 of us said that they would be ok with that. Romeo would still be in love with Rosaline, and he and Juliet would still be alive, their families would still be fighting but still they might have been happy. If Juliet haven’t meet Romeo she might have fallen in love with Paris, and who knows that if Romeo and Juliet were married they wouldn’t have divorced? Teenagers today read for pleasure just as much their parents-or grandparents- read when they were teens. This means that after all the time and effort dedicated by schools and publishers to increase student reading, the statistics show no increase in the number of teenagers who read for pleasure? I find this a proposition just a little depressing. 65 years and no improvement in teens reading for pleasure? Why not? That conclusion is really depressing. There have been considerable efforts to increase student reading on several fronts beginning in earnest with Rudolph Flesch’s Why Johnny Can’t Read: And What You Can Do about It published in 1955. While this book dealt primarily with the methodology of teaching reading (phonics), the book’s message about the importance of literacy spike a nation’s interest in improving reading skills-an important step in student reading for pleasure. On the education front, the inclusion of SSR (silent sustained reading) during the school day began over 30 years ago. One of the tenets of SSR is that students have the opportunity to choose materials to read. The practice of SSR has travelled from elementary to many middle and high schools in order to respond to student demands for choice. Finally, on the publishing front, there has been an explosion of children and young adult literature in the past fifteen years: 3,000 young adult novels were published in 1997; 30,000 titles in 2009. In 2009, total sales exceeded 3 billion. So, these quick examples suggest there is evidence there is heightened awareness about student reading for over 50 years, there is time provided in school, and there are materials published. Yet, there has been no increase in teenagers reading for pleasure? But student communication with their peers can be limited in vocabulary and scope. A recent student in Britain by Lancaster University’s Professor Tony McEnery who conducted research creating analysis of a database of teenage speech that suggested British teenagers had a vocabulary of just over 12,600 words compared with the nearly 21,400 words that the average person aged 25 to 34 uses. In other words, communication with peers does not increase vocabulary, and this study did not include texting adaptations of vocabulary with acronyms or shortened spelling. Yes, this study was conducted in Britain, but it is unlikely there is much difference in the vocabulary of American teens, other than that lovely accent. Krashen is very clear to point out that students “are reading peer writing, not Hamlet or the Federalist Papers. And they are writing to each other, not composing essays comparing and contrasting Edgar Allen Poe with Longfellow.” But, I am not comforted that Krashen offers social communication as voluntary reading despite his claim that students experience cognitive development when they write on topics of deep personal concern. I do agree, however, with Krashen’s claim that “the true problem in literacy is not related to convincing reluctant teenagers to read: It is providing access to books for those living in poverty.” I would go further to suggest that all schools, economically privileged or not, need to create reading material rich environments for students. 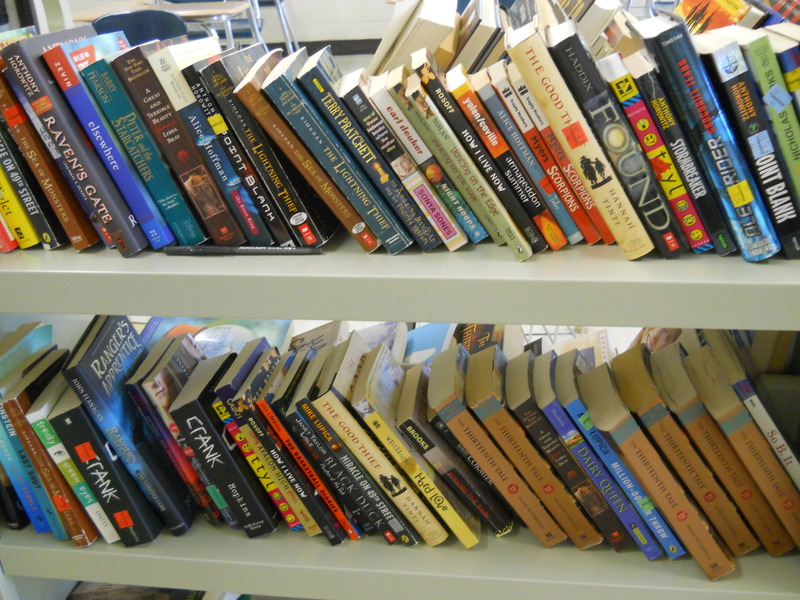 Our 9th grade students are provided SSR time twice weekly (20-25 minutes/day) to read for pleasure. They may choose what they want to read. Often, a student will arrive in class without materials or, having just completed a book, looking for a recommendation. Our classroom libraries (book carts) are filled with high interest used books purchased for exactly this moment, and our school library is now connected to Overdrive which allows students to check out an ebook on a mobile device. This ability to capitalize on this moment of student’s interest with reading materials is critical to a successful reading program. The hope is that this will lead to continued reading for pleasure outside the classroom. Krashen’s review of the data is depressing; I would have expected that given the amount of attention given to increasing teen reading for pleasure that there should have been a steady increase in reading habits from generation to generation.He cautions that negative attention given to this topic, including “dissing high school students”, is not the way to increase reading for pleasure. Teenagers by nature, regardless of their generation, should come to reading for pleasure through availability AND choice. Just ask your mom, or grandma, can we do better?